This digital spin on Where's Waldo? ditches the color, but adds so much more life. Looking to relax after a long, hard day? Finding a game to match that laid-back mood can be challenging indeed. More and more games are focused on competition, whether it’s live or via leaderboards, while ultra-challenging games are especially in vogue right now. And that’s not even considering how games with timers or move limits continually prod you. Games can be stressful sometimes! None of that is bad, per se, but if you’re intent on playing something that won’t raise your ire or have you yelling at an opponent halfway across the world, then consider playing Hidden Folks. 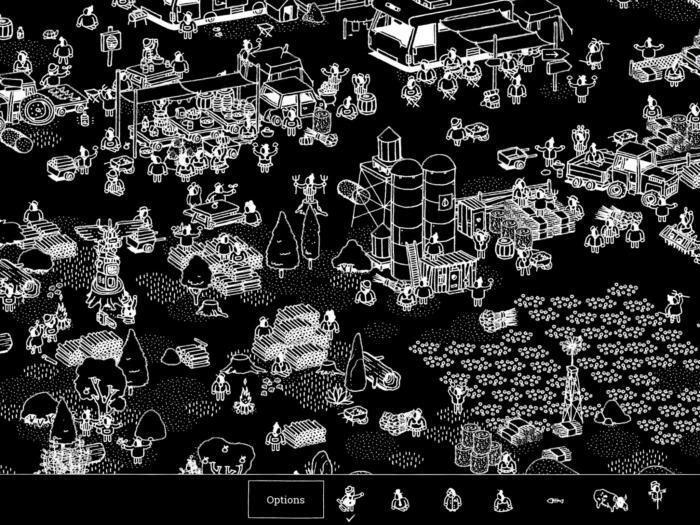 This immensely chill, monochromatic game has a really clear inspiration—the classic Where’s Waldo? (or Where’s Wally?) children’s books—but takes it digital with a ton of personality, as you hunt around these sprawling maps and interact with the various items, creatures, and people in sight. This is just a small, zoomed-in chunk of a much larger location. Hidden Folks hails from Adriaan de Jongh, an indie creator known for designing iOS games that are anything but typical. Bounden is a key example, as it has two players holding the same phone and dancing as they move in unison, while Fingle is like a sensual game of Twister for two players’ fingers. Hidden Folks is a much quieter and more solitary experience, yet it stands tall next to those creations as an iOS game that is totally memorable and distinctive. Intrigued? 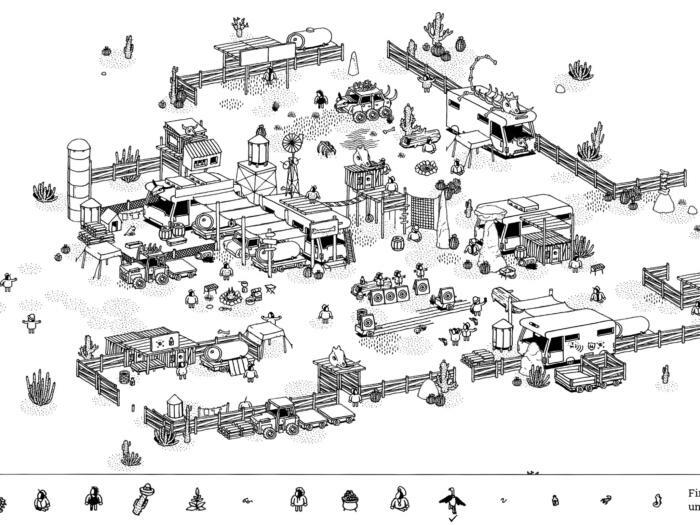 Here’s why Hidden Folks is such a striking, standout iPad and iPhone game. Hidden in plain sight: As mentioned, the primary inspiration here is surely none other than Where’s Waldo, the book series that dropped the striped-shirt, bespectacled hero into crowded scenes and challenged readers to find him. Here, you’ll do much the same: the people, items, and creatures you seek are listed at the bottom of the screen, and you’ll scroll through each black-and-white illustration to discover them. That’s such a great Pokémon Go reference. There’s a bit more than just finding little people and things amidst these densely-populated areas. You’ll also uncover little puzzles of sorts, in which one action will trigger another, or you’ll need to tap open doors or tent openings or move an object to see what’s inside or behind. Elsewhere, you may water and grow crops via well-placed taps, for example. 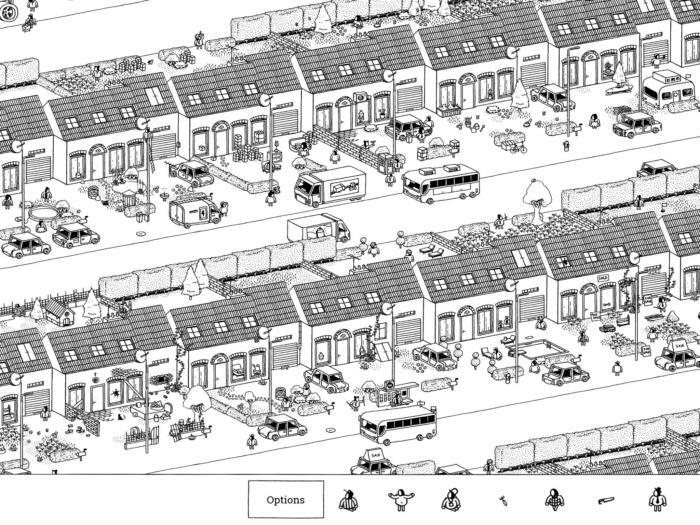 Hidden Folks gives you little clues in each character’s description, but beyond that, you’ll need eagle eyes and a bit of curiosity to seek them out. 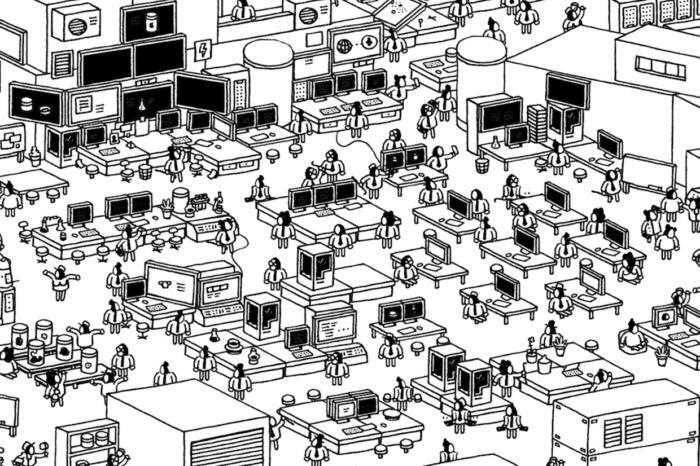 It’s incredibly charming: Primarily created by de Jongh and illustrator Sylvain Tegroeg, Hidden Folks really does look like a handcrafted effort—and I do mean that in the best way possible. The black-and-white, hand-drawn graphics look like something you might have doodled while sitting in a tedious school lecture, except there’s so much going on in some of these sprawling tapestries. There are plenty of little scenes and happenings in each larger image, not to mention pop culture references and plenty of animation. It might look simplistic at a glance, yet it’s clearly labored over. And sound plays a bit part in how alive the game feels. Tapping on a person, a car, or an animal generates a sound effect, and seemingly every sound has come from a human mouth. They’re the kind of noises you’d make while playing with toys and imagining elaborate worlds, and the sensation that results here is so joyful and exuberant. 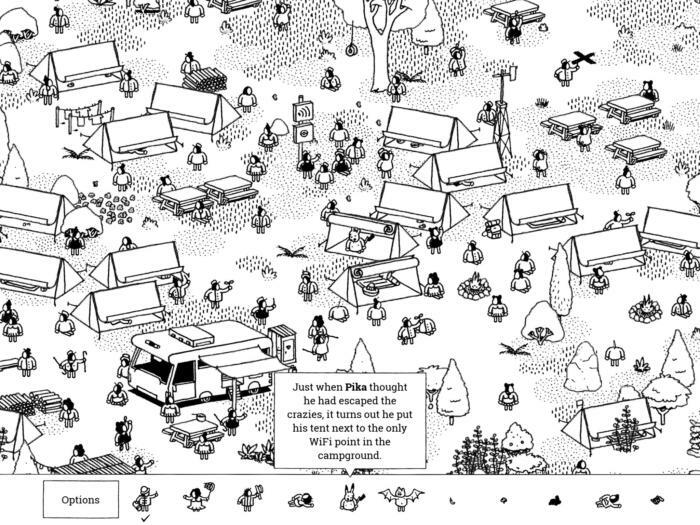 Play at your own pace: Hidden Folks has objectives, but it never pushes or punishes. You’ll need to find a certain number of items to proceed to the next area, but you can play as quickly or slowly as you please, or just noodle around for as long as you’d like. Each new area brings fresh terrain, with more than 120 characters to find along the way, yet that same tranquil attitude remains throughout. There’s no pressure. You can even engage black or sepia color options if you think they’ll help your hunt. It’s so key to Hidden Folks’ appeal. The game might crib its fundamentals from an iconic 1980s book series, and there are other iOS image-find puzzle games that are flashier or burdened with freemium elements—like Where’s My Geek? and yes, Waldo & Friends. But the breezy approach, premium design, and lived-in worlds give Hidden Folks a unique hook, and make this warmly low-key experience a really enticing one, too.